The purpose of marriage was, above all, to produce and provide a stable environment for the rearing of children, especially male children to carry on the family name and business and extend the family’s web of alliances. Estimates are that as many as 20 percent of mothers and children died during childbirth. It is not surprising that prayers and amulets—and imagery—were deployed to ensure success at every possible step, beginning before conception and continuing through birth and infancy. The birth of a child was an occasion for a Florentine family to commission a descho da parto, or childbirth tray. Most, maybe all, trays were presented for male children. These painted wooden platters were used to bring fruits and other refreshments to new mothers, but they also served as souvenirs or mementos of the births. The descho da parto painted to celebrate the birth of Lorenzo de’ Medici, for example, was listed among the contents still in his bedchamber when he died in 1492.The descho da parto was, however, a short-lived phenomenon, superseded in the early sixteenth century by ceramic or turned wooden bowls called tafferia da parto. 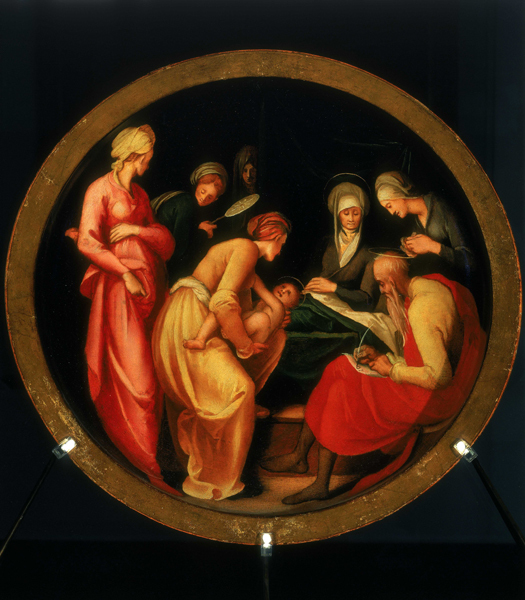 Unlike the older painted wooden trays, the bowls seem to have been decorated with sacred scenes that related to childbirth, but like the deschi they typically featured heraldic decorations on the reverse.This tafferia da parto painted by Pontormo illustrates the naming of John the Baptist (told in Luke 1:11–13 and 57–63). John’s father, Zacharias, had been struck mute by God for not believing that his wife, Elizabeth, elderly like himself, would conceive and bear a child. When it came time to name the child, the father could only write the name on a paper—but as he did so his voice was restored. The reverse is decorated with the arms of two prominent families in Florence. Another almost identical bowl has the arms of two other families, suggesting that Pontormo and his workshop created these as stock items that could be customized. Children were baptized soon after birth, often within hours. In Florence, where John the Baptist was patron saint, baptism carried civic as well as religious importance. 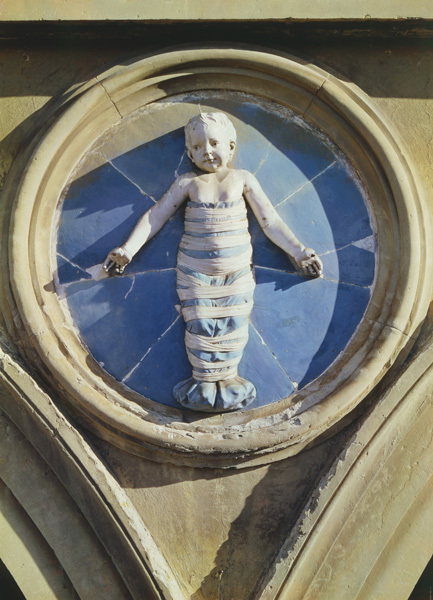 The church taught that babies who died before baptism went to Limbo; in Florence they were buried in the Piazza del Limbo, not with other members of the family. Speed, therefore, was essential. Baptismal sponsors were called coparents (compare) and became important members of a child’s network of supporters as he or she grew up and throughout life. At birth and baptism, children were given beautifully made gowns and embroidered swaddling. Like bridal dowries and costumes, the baptismal gifts sometimes came under restriction of sumptuary laws. In wealthy and merchant families, boys and girls were educated together at home for the first few years, often by their mothers—one reason that it was deemed important to educate girls. Older children went to schools or, in richer households, had tutors. In Florence, families could choose to send their sons to abacus schools, where they concentrated on arithmetic and knowledge useful in business and trade, or they could elect for a broader, humanist education in the classics. Estimates of literacy in Florence in the late sixteenth century are as high as 65 percent for males. Portraits with boys and girls together were probably more common than portraits of girls alone. This one was made by the first female artist of the Renaissance to achieve an international reputation. Unlike most other women artists of her time, who were daughters of artists, Sofonisba Anguissola was from the minor nobility and probably learned to paint as a gentlewoman’s activity. She is best known for portraits—among her first subjects were her own young brothers and sisters playing chess. Many of her sitters posed in domestic settings with greater informality than was the norm. Moral and religious education, considered essential to the proper Christian rearing of children, was of paramount importance and employed several mimetic devices. Children dressed up as saints (and also dressed up images of saints, giving them garments and flower garlands). They enacted religious plays at home, and boys took roles like those their fathers performed during public religious pageants sponsored by lay confraternities. Theologians suggested that images of saintly figures were good models for boys and girls, particularly if they were depicted at similarly young ages, and recommended that such images be displayed at home (see “Advice for the use of religious images in childrearing”). 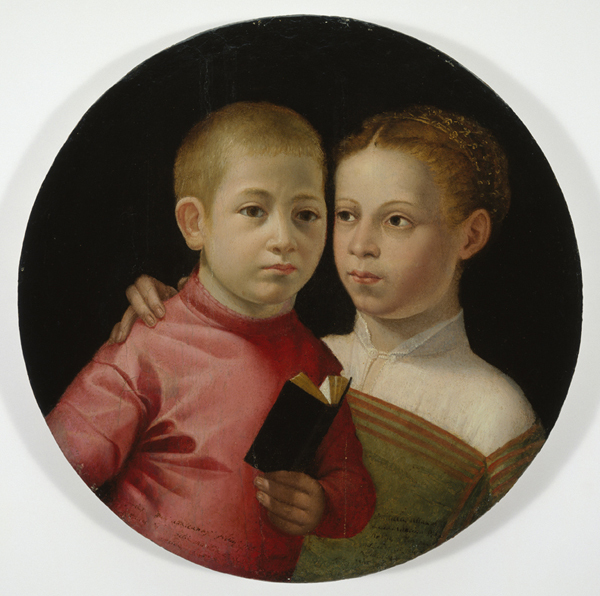 Children had a new status as individuals during the Renaissance, and their moral development was of increased concern, not only to parents but also to the state, which needed them as good citizens. In Florence the new appreciation for childhood was expressed by the founding of the Ospedale degli Innocenti (Hospital of the Innocents), which took on the welfare of children as a responsibility of the state. Designed by Filippo Brunelleschi, the building was among the first expressions of new Renaissance style in architecture. Brunelleschi had intended the roundels to be plain black stone, but the city commissioned glazed terracotta roundels with images of swaddled infants from Andrea della Robbia. Children remained, nevertheless, completely under the control of their families (their fathers really)—girls until their marriages, boys until they were formally emancipated, usually at about age twenty-five. Only then were they fully free to act on their own initiatives and assume a role in family finances. Many sons continued to live in their parental homes for several years even after they married, making many Renaissance households multigenerational. Because mothers (and their siblings) were typically younger than fathers, many children had closer ties with their maternal uncles than with their father’s brothers, who were likely much older. Surviving sons or paternal uncles assumed responsibility for women and youngsters after the death of a father (although, as we have seen, widows normally returned to their own birth families).